DESPITE THE HYPE surrounding them when they were first launched, the new methods of contactless payments are taking their time rolling out. You have three major players in the market: Apple Pay, Samsung Pay and Android Pay. Despite them being a convenient way of paying for goods – you pay by tapping your phone on a contactless payment terminal – the number of countries they’re available in can be counted with both hands. When you see the UK has access to Apple Pay and (soon) Samsung Pay, it does make you wonder why it isn’t an obvious swap for Ireland. The answer boils down to a few reasons and one of them is infrastructure: specifically, the infrastructure for contactless payments. When asked about whether Samsung Pay would arrive in Ireland, the head of Mobile PR for Samsung, Morgan Evans, explained it in the context of its global rollout. 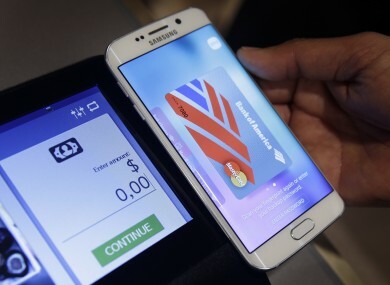 Last month, the company launched Samsung Pay in its first European country, Spain. But more than a year after it launched, the only other countries where it is available are the US, South Korea, China, Singapore, Australia, Brazil and Puerto Rico. “The dynamics of the payments market are really diverse in every market,” he said. “Even if you take Europe as an example, one of the reasons we launched in Spain first was because there was a really high penetration of NFC (Near Field Communication) and contactless payments there. It’s well over 75% of POS (Point of Sale) terminals while it’s more varied in other countries… there’s a lot of work to be done in each local market”. It’s important to note that this was in relation to Samsung Pay, but such a statement and the speed of its rollout could be applied to its rivals too. As mentioned earlier, Spain’s high rate of contactless payments was one reason why it was chosen – but it’s an important reason. NFC is the technology needed for contactless payments to work and while most phones already have it, it requires the banks and other financial services to play ball with it. That means they have to form new partnerships in every country, a process that is anything but straightforward. Over 35,000 Irish businesses currently offer contactless payments terminals, and there are three million contactless debit and credit cards, according to AIB. It’s a decent number but not enough for a company like Apple or Samsung to dedicate their resources to rolling out their own payment services. By comparison, Spain has 593,000 terminals and 11.5 million contactless cards according to Visa. That’s a significant difference, and for a new service, it needs as large a market as possible for it to work. For any of these services to work, contactless pay needs to be almost ubiquitous with major retailers and common with smaller ones. The sheer amount of effort needed for banks, shops and other financial entities to be on the same page for one country means companies have to pick their markets wisely. Picking one that doesn’t have the infrastructure makes no sense. Until that changes, you’ll still need to have some cash or a card on you at all times. Email “You won't be paying for your shopping with your phone anytime soon”. Feedback on “You won't be paying for your shopping with your phone anytime soon”.